The third album can be crucial for an artist. A second album can still rely on the success of the debut, but with the third album, the audience starts to have high expectations. If the artist sticks with the same style, (s)he risks to lose the intrest of the public. If (s)he tries something new, there's the risk the audience just won't like it. For Madonna this crucial album was True Blue. After her debut album she scored high with Like A Virgin, but would the audience want to taste another album like that? Madonna would now show a characterictic that would be one of the most important elements of her career: the ability to re-invent herself and that way produce a more developed and mature sound, different from the previous material. 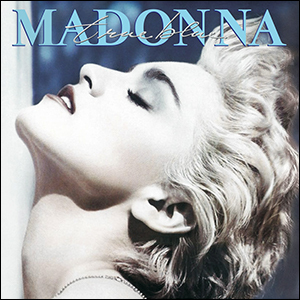 True Blue would become the album with which the critics finally started taking Madonna serious as an artist. Also typical would be the choice of her producers: an old one and a new one. Steve Bray, who she had collaborated with for years, co-produced 3 tracks on the album. Patrick Leonard was the new guy in the picture who co-wrote and co-produced 5 other songs. Only Where's The Party was produced by Madonna, Bray and Leonard together. The competition between Bray and Leonard resulted in 9 great tracks, with a more mature sound than the two first albums. The album was released on June 30, 1986. Madonna had recorded the album after she got married to Sean Penn in 1985. She dedicated the album to him, referring to him as 'the coolest guy in the universe'. Witty Madonna would use the same reference to her second hubby Guy Ritchie when she dedicated I Deserve It on her 2001 Drowned World Tour. 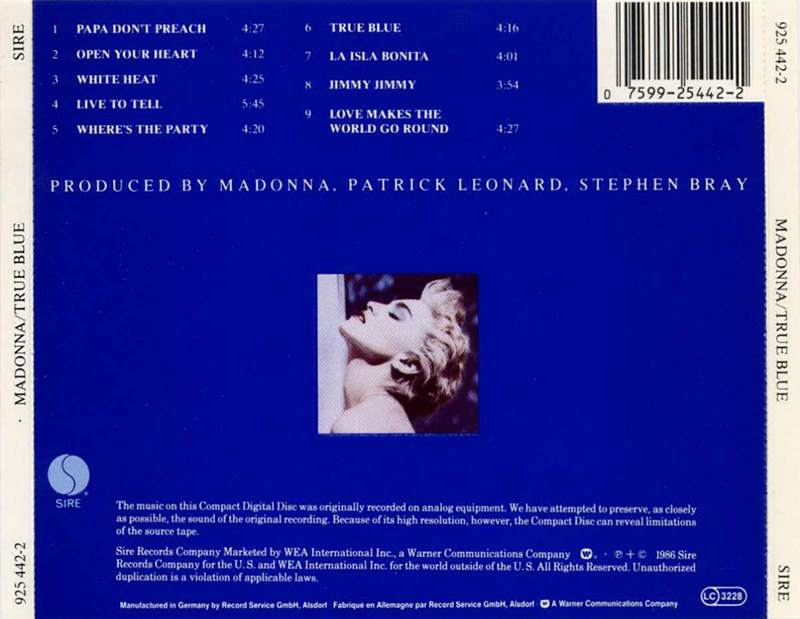 Live To Tell, the first single of the True Blue album (and the working title of the album), was originally written for the movie At Close Range which starred Sean Penn. The movie flopped but the song became a big hit. Papa Don't Preach equaled this success and became #1 as well. The title track was a rather different sound, but then she was back at the top with Open Your Heart. How many hits can one album have? In any case, the fifth single was a classic too: La Isla Bonita. Those five singles gave Madonna three #1 hits in the US, the UK, Canada and Japan and one in Australia. No surprise that True Blue topped the album charts in Australia, Canada, France, Germany, UK and US. The album was certified 7 times Platinum in the US (1995) and worldwide it sold an estimated 25 million copies, which still stands as her best selling studio album. In 2001 the album was digitally remastered and the Color Mix of True Blue and the Extended Remix of La Isla Bonita were added. The same year of its release, True Blue received a Juno Award for Best International Album.